I'm sure that by the time this is posted I must be watching my son open his Christmas gifts from Santa. I'm excited for him, since I know my family has been very very nice to my little guy and has spoiled him rotten! I know he is not going to believe his eyes. You know Christmas is for the kids more so than for the adults but I do have a nail-polish gift under the tree that came very very far away that I will be opening at midnight! (12/24) - that is if i can wait until then! Gigantic hugs from me and my family to you all! 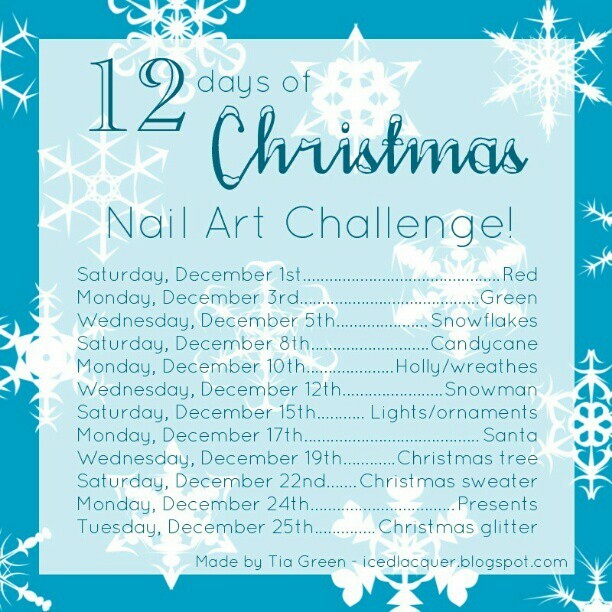 This is the last of the challenge posts hosted by the lovely Tia. Thank you Tia for hosting this awesome challenge. I decided to go with a favorite from Color Club - Holiday Splendor, this is three coats and elmer's glue base for easy removal. My internet at home is still not working so I have been struggling to upload pictures, content and also comment like i usually do. Please forgive me - i have been using my phone to post (very hard) - once i get that resolved I should be back to business...hopefully soon. It's such a gorgeous polish - like a slightly lighter green than China Glaze ATLANTIS! Wow lovely color! What a great polish. Mery Xmas! It looks gorgeous on you! Merry Christmas! I love this! It is really pretty!